It wasn’t yet nine o’clock on that Sunday morning that Kerry died. People would wonder why anyone would be calling at such and odd hour. But when they heard my voice they would know instantly, they would figure it out. Their mind would instantly catch up and they would know I was calling to tell them Kerry had died. There would be a dozen telephone calls to make. They would be to the usual assortment of relatives and friends. The message would have to be thought out in advance – what to say, how to word my dreadful message. My grief would have to be put on hold for a little while to help others through the tragic news of the moment. So with pad and pencil I sat down and wrote and quickly re-wrote what I needed to say. All the while we waited for the necessary EMS to arrive. Having composed the message I went over it, speaking aloud, checking my voice and tone and inflection. My voice needed to be soft but not weepy. And so I began. First I called Kerry’s Grandpa Schwarz, his only living grandparent. Then it would be my brother and next my sister. Although my sister was closer to Kerry my brother was the oldest. I felt that a protocol had to be observed. Then it would call godparents and friends. Kerry’s mother was an only child. “Good morning. This is Tom. Sorry to call at such an early hour.” After their “Hello” I continued. “It was sure cold last night. It was zero here.”Then pausing to let their mind catch up after their, “Ah huh” I continued. I knew that they knew what I was going to say next. I was going to lay a grenade in their heart and pull the pin. Quietly and softly I said, “I’m sorry to tell you that Kerry died a little while ago.” And I stopped, letting them gasp for breath. Sobs and muffled sounds came over the earpiece. Followed by, “Oh no.” And then the sounds of more sobbing. Kerry’s mother was never one for hyperbole or exaggeration. She was never given to loud outbursts of laughter or periods of being teary eyed. If she said something, one could carve it in stone or take it to the bank – so to speak. She was solid in her words way back then, back in 1979 a couple weeks into March, after Kerry died. 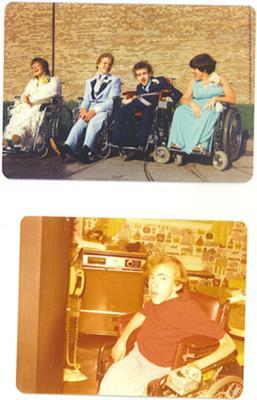 While Kerry lived, muscular dystrophy had savaged his body. Scoliosis had twisted his spine to the point that he was pigeon chested – his chest was turned almost 45 degrees off center. When he laid on one side, it looked like he had a small basketball under his ill fitting t-shirt. Laying in any one position was uncomfortable for anything approaching an hour. Not having the strength to move himself he called out to be moved all night, every night, once and twice an hour. His mother slept lightly for years. Each one of those nights, never failing Kathy would answer Kerry’s mournful cry. His pitifully small body still had a baritone voice that shook the walls with his, “Maaaaaaaaaa! !” It was a plea, not a demand. His mother faithfully answered his plea. Silently she got up and went to her son. The vignette was played out each time with the same words, “I’m sorry,” followed by, “It’s OK. Go back to sleep.” And she would roll him over. Like good mothers everywhere she answered the call of her child and did what mother’s do – exhibit unfailing, unconditional love. On one of those mornings back then – a couple of weeks after his death – we were having our coffee, zombie like – silent. We were still numb from Kerry’s death. There was never much to be said at the breakfast table. The television was on in the family room catching the latest news that went unheard. Morning newspapers were unfolded but went unread. Much of the morning coffee time was spent looking absently out the kitchen’s picture window into space. So when she spoke I was surprised. She looked at me solidly. She looked puzzled. “That’s all I remember,” she said. She wondered what it was all about. I knew immediately and smiled. Dreams are nebulous. Visions are telegrams. Wendy: Thanks for sharing your story on my pages. Kerry and God were definitely sending your wife a message! Very Cool! p.s. It always amazes me to see someone so local... I'm in Mt. Clemens, right next to Clinton Twp. Howdy Neighbor! I know how difficult it was to let go of your son. That dream was his way of telling you it was ok, he was in good hands, and the body that had held him back all those years did so no longer. My sister died several years ago and I remember speaking at her memorial service and saying that I was convinced she now traveled with wings and was no longer confined to her wheel chair.